In large bowl, combine 2 cups flour, sugar, salt and yeast. Blend well. In small saucepan, heat water and oil until very lukewarm (120 to 130 degrees). Add warm liquid to flour mixture. Blend until moistened, then beat with beater 3 minutes. Stir in 2 1/2 to 3 cups flour until dough pulls cleanly away from side of bowl. Knead 10 minutes, adding a little flour at a time, if dough feels sticky. Grease lump of dough. Put in bowl to rise and cover with towel. Let rise until double, then punch down. Divide dough into 2 parts and shape into balls. Let rise on counter covered with inverted bowl for 15 minutes. 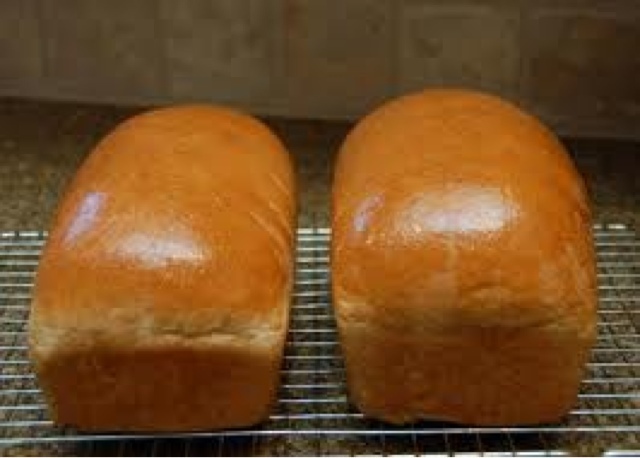 Shape into loaves and place in 2 greased pans. Let rise in warm place about 1 hour or until it has risen about 1 inch above pans. Bake at 375 degrees for 45 minutes or until loaf sounds hollow. Remove from pans and brush top with butter. Makes 2 loaves.